You could say the big “disruption” of the morning came when TED opened up the second day of INTX with four speakers who are shaking up the landscape around them. 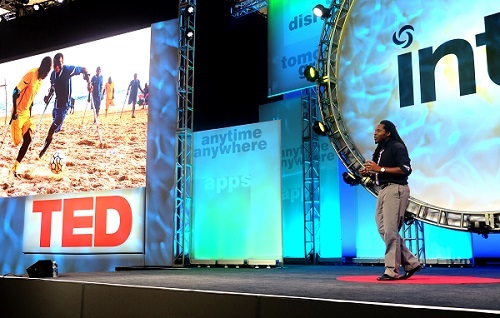 In classic TED-style presentations, a crowded room heard not only about how each of them got their start and the blood, sweat and tears that is often involved in launching something new, but about the importance of thinking differently, or unconventionally, when finding solutions to societal problems—and the fearlessness that’s needed to “disrupt” tradition in order to change the world. Comedian Negin Farsad, who was named one of the Funniest Women of 2015 by the Huffington Post, got lots of laughs throughout her presentation, as she conveyed how the power of humor can be used to combat the injustices and discriminatory practices around the world against Muslim populations. Biomechatronics engineer David Sengeh explained how he came to improve the comfort and fit of prosthetic limbs for amputees who couldn’t wear prosthetics because it caused them too much pain. His invention is one that people heavily doubted, as he was told at the start that it would take the work of three Phds to accomplish. But he persevered. Boston criminal prosecutor Adam Foss took a chance on a kid involved in one of his cases. He shared the inspiring story of how that same kid ended up turning his life around, graduating college and pursuing a lucrative career—all because Foss took the approach of educating and rehabilitating someone rather than just throwing him in jail. The program he created is one that reinvents probation as a transformative rather than punitive experience. These are innovators who are defying the odds. And then there’s Jesse Genet, who decided to disrupt the direction of her life at a young age to start a business that focused on a fabric die that develops color in the sun and is found in over 1500 retail stores. Inkodye turned out to be quite a success—she even got the opportunity to turn down investors during her stint on Shark Tank. Genet ran most of her business from her loft in Los Angeles, virtually growing a business from “nothing” into “something.” But here’s the kicker–despite her company’s success, Genet decided to take another big risk and “disrupt” her business by launching a whole new company. Why would someone just decide to mess up a good thing? Genet explained that the more interest her company got, the more she realized that customers were actually after something else entirely. She took a close look at trends in the data and emails she was receiving and it dawned on her that her customers were more interested in how Inkodye was getting the product to the market, then the actual product itself. But instead of getting down on herself, she took the opportunity–and the risk–to get even more creative. And that’s how Lumi.com was born. Genet launched Lumi in 2015, a business that makes it easy for businesses to order the branded packaging and supplies they need to ship their products. Now, custom printed tape may sound a little mundane to you, but it’s actually the first step you take to becoming the next Amazon, she explained. However, while Lumi.com was taking off, Inkodye suffered. It was the price that Genet paid to build a new idea. “But I realized that my journey was never about a single product. It was about making something that people wanted,” she said. Genet told the audience that big ideas come from humble places and from patience. But mostly, they come from a willingness to work hard to build something, only to then realize it’s not what customers actually want. And then to start over and create something totally different. Something even better. In the Internet and television world, we see that every day. Programmers and Internet providers that strive to build that connection with users. Start-ups are born and in no time they forever change the way we engage with media and technology. In our new media economy, it’s about offering people a menu of choices, whether it pertains to how they get their media content, what programming they watch, which technology products work best for them, and how to make their lives better through connectivity. Jesse Genet and “Girl, Disrupted” from NCTA on Vimeo.